Live boldly with this Nissan Micra. Break away from the pack with fun to drive agility and impressive fuel economy. Say yes to European design, grab onto the leather-wrapped steering wheel, and shine on with chrome in all the right places. Regardless of your plans, you've made the right choice with this fun, affordable Nissan Micra. This low mileage hatchback has just 36193 kms. It's metallic blue in colour. It has an automatic transmission and is powered by a 109HP 1.6L 4 Cylinder Engine. It has some remaining factory warranty for added peace of mind. Our Micra's trim level is SV. The SV trim adds some nice features to this affordable hatchback. It comes with an AM/FM CD player with an audio aux jack and four-speaker audio, Bluetooth hands-free phone system, steering wheel audio and cruise control, air conditioning, power windows, power doors, 60/40 split folding back seats, and more. 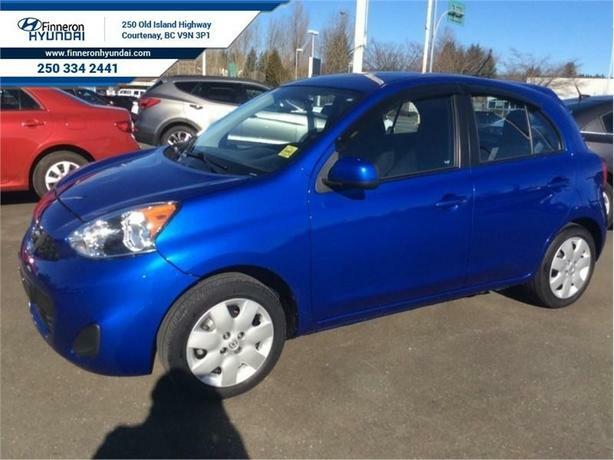 This 2015 Nissan Micra is for sale today in Courtenay. Buy this vehicle now for the lowest bi-weekly payment of $67.15 with $0 down for 84 months @ 5.97% APR O.A.C. ( Plus applicable taxes - Plus applicable fees ). See dealer for details.